Colorkitten's Action Blog: it's strawberry season! 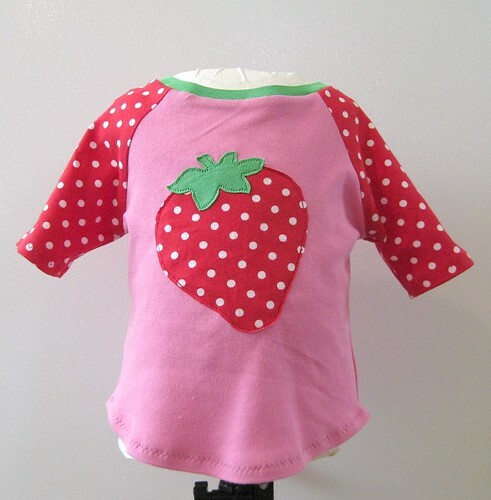 Some polka-dot jersey and pink interlock, plus a little green baby-rib from an old t-shirt. The pattern is Zoe from Farbenmix -- it looks a little like a rashguard to me, but it came out pretty cute. Emily certainly loves it! Strawberry and stem were freehanded and then cut out. (Is that even English?) I also tried the Farbenmix-recommended triple zig-zag on the hems, and I actually really like it a lot. I will definitely be doing that on knits from here on out! I did not try the recommended ironing-the-shirt-before-you-take-a-photo technique there, apparently. Oops! If you are in a strawberry locale, I hope you enjoy your June berries as much as we do!! I used the zig-zag to hem pj's - worked like a dream. The shirt is adorable! Point me in the direction of cute knit fabric, please.